Obviously, this bubble car is fresh in your mind from its noisy two second bit in Don't Be a Menace to South Central While Drinkin' Your Juice in the Hood (5:24) but in case you forgot, it's the 1960 NSU Prinz. Doing as many other late fifties motorbike companies like Zundapp and Vespa, NSU was also looking to transition into the somewhat booming microcar industry. NSU brought this offering to the table, the Prinz 30. It's unoverheatable gas hoarding roadability (according to the ad, anyway) won it 3,247 US buyers in 1959, its first model year. 1960 was the last year for the rounded body style before switching to the "Mirco-vair" look in '61. 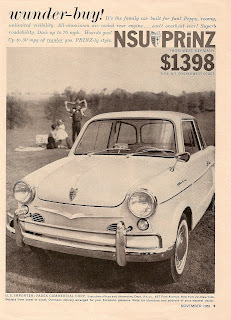 Unfortunately, the only Prinz variant to receive the excitingly fugacious Wankel engine was the two door convertible.